South Korea will sharply increase its investment in science and technology setting a 92.4 trillion won ($80 billion) budget to finance research and development projects in new growth sectors by 2017, the government announced on Monday. The plan represents a more-than 30 percent increase from the previous Lee Myung-bak administration’s five-year budget of 68 trillion won. As part of the five-year science and technology development project, the budget will be allocated to enhancing agricultural and medical technology as well as supporting basic science research. The government said it believed the investment would help elevate the level of science and technology research and help create some 640,000 new jobs. South Korea’s ministry in charge of science, information and technology said Thursday that it will create jobs by fostering an environment for business start-ups and bringing the country’s scientific research close to a world-class level. Under the ministry’s plan, a total of 408,000 new jobs will be created by 2017, about 90,000 of which are to come from business start-ups. 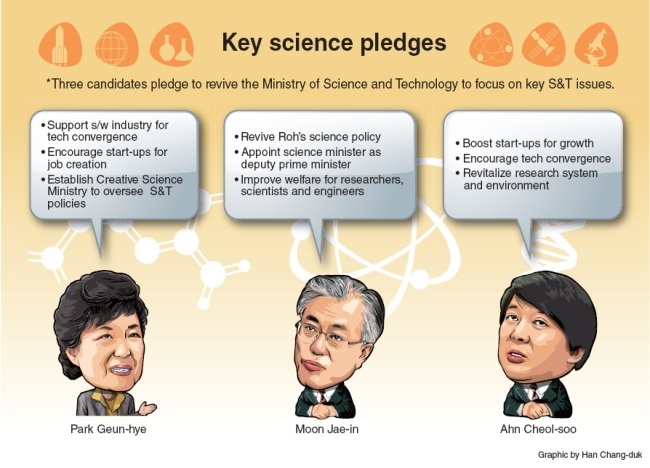 President-elect Park Geun-hye is looking to enhance the country’s science and technology competitiveness with the establishment of a powerful new ministry that will oversee research and development policies and industrialization of innovations. But it seems Park is already facing a major obstacle with the delay of a project to build a mega science and business complex that promised to house world-class basic science research organizations and related business facilities. The government is planning to complete the International Science and Business Belt by 2017 in a 3.6-square-kilometer area of Daejeon. To make the mega project more prosperous, the government is also planning to bring in some 500 foreign experts by the end of 2017. The plan, however, faces an uncertain future due to political wrangling among the central and local governments and ruling and opposition parties. 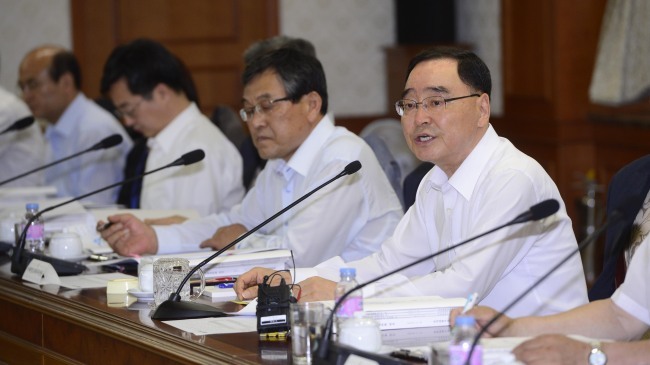 The National Assembly failed to allocate the budget for the project as the central government and Daejeon city differed over how to share the expenditures. The government pledged to invest a total of $4.9 billion into the complex, calling on the Daejeon Metropolitan Government to pay its half of the bill. But the city refused the demand, claiming it was a national-level project. Cancer patients are exposed to potentially harmful radiation during CT (computerized tomography) scans and other X-ray procedures, as well as invasive tests using radioactive isotopes. That may change if the Korea Communications Commission’s (KCC) plans to back Korean technology aimed at providing a new method of cancer diagnosis succeeds. The KCC affiliated Electronic and Telecommunications Research Institute (ETRI) is behind experiments using electromagnetic waves in the 3-gigaherz spectrum to detect breast cancer, one of the six cancers that Koreans are most prone. Clinical trials have been approved by the Korea Food and Drug Administration (KFDA) with a view to commercialization by 2017. Detectors spot the difference in the electrical response time of healthy cells and cancerous ones using a technique dubbed “micro-wave” tomography. Heavy backpacks full of books strain students’ shoulders and symbolize their plight. But maybe not for much longer as digital textbooks become the norm. Apple, the global leader in IT innovation, has jumped into the digital textbooks market, launching iBooks 2 in January. Unlike their simple predecessors, the new software supports diverse interaction with the users. Not to be outdone, Samsung Electronics is as ever ready to duel with its Learning Hub, an educational content service through which around 6,000 exercises for all age groups will be provided. Users can download the service on their tablets. “Digital textbooks mean more than converting textbooks into a digital format,” said Jung Kwang-hun, a researcher at the Korea Education and Research Information Service, in a report.